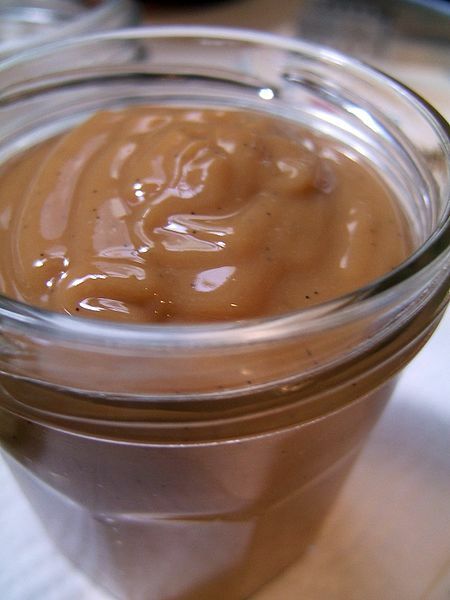 Dulce de leche in Spanish is a milk-based sauce. Found as both a syrup and a caramel candy, it is prepared by slowly heating sweetened milk to create a product that is vaguely similar in taste to caramel. It is also the basis for the elaboration of many sweets and desserts which form part of the classics of the Argentinian, Colombian, Paraguayan, Chilean, Peruvian, Uruguayan and, Brazilian cuisine. Left: A jar of dulce de leche. It is especially popular in South American countries. The French preparation confiture de lait is very similar to the spreadable forms of dulce de leche. There are also similar desserts around all Latin America (such as cajeta in Mexico or manjar blanco in Peru). The most basic recipe calls for slowly simmering milk and sugar, stirring almost constantly, although other ingredients may be included to achieve special properties. Much of the water in the milk evaporates and the mix thickens; the resulting dulce de leche is usually about a sixth of the volume of the milk used. The transformation that occurs in preparation is often called caramelization, scientifically described as the Maillard reaction, a chemical reaction that is responsible for browning, which helps to develop many of the flavors of cooked food. Dulce de leche is used to flavor candies or other sweet foods, such as cakes, cookies or ice cream, as well as crème caramel ("flan" in Spanish and Portuguese). It is also popular spread on toast. 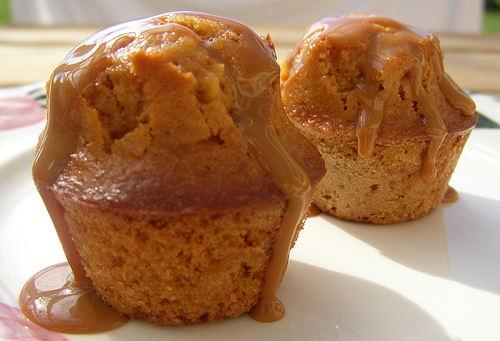 Left: Muffins with dulce de leche sauce. One of the most common Polish confectioneries, Krówki, might be considered "Dulce de Leche candy".